The game lasts 6 rounds and the goal is to score the most victory points (VPs). Each player starts with some novices and a shrine which are spread across 6 islands and it is here where most of the gameplay takes place. On their turn, a player gets to perform 1 action. There are 14 to pick from, which is a lot to take in when starting your first game, but they soon make sense and the advantages of each is easily seen. I won’t try to explain them all but will give an overview. 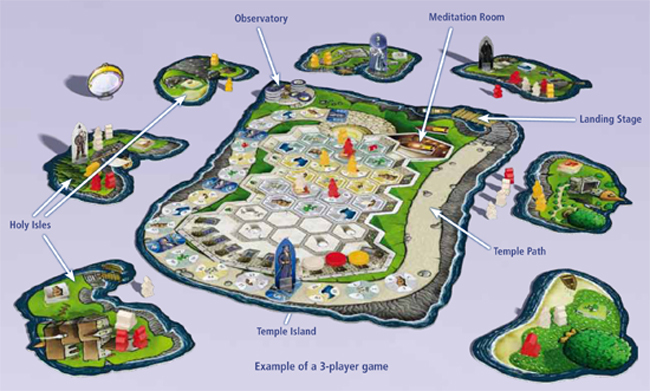 The core element of the game are your novices (meeple) and these can be on an island (active), next to an island (inactive), or in the temple on a tile. Many actions require active novices and these become inactive (placed next to the islands) when used. Not only does a player need to work out how to get the most benefit out of the limited active novices available, but they also need to work out where they want their novices next round (because inactive novices get placed onto the islands they are next to at the end of a round). Why is it important to have novices on certain islands? First, the Moon Priestess, Master Builder and Apostate figures move to different islands each round and these can: earn the player VPs, lose the player VPs, and allow a player to build a shrine respectively. Second, there are 6 different favour tokens that can be earned which give the player a special ability or action when spent, and each island is the only location to earn each specific favour type. Using actions, players can gain favour tiles, gain extra novices, build shrines (which reduce the active novice cost for some actions), move novices to different islands (some favour tokens allow various movements too). As well as actions on the islands, there is the temple. Around the temple are temple tiles and a player can use an action to move a novice onto a tile of the type that matches the island they are moving from. 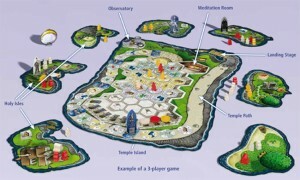 A separate action allows the player to move the occupied temple tile into the temple which scores instant VPs, plus it can potentially dislodge opponents’ novices from the temple too (which return to the islands). Finally, there is the council too. Players can use an action and active novices to move up the council track which determines how ties are split and scores VPs at game end. VPs are scored in several ways at the end of each round. Players with active novices and shrines on the Moo Priestess’s island score VPs based on who has the most. Players with any novices on the Apostate’s island lose VPs. Each novice in the temple scores 1 VP too. Also, there are extra VPs at game end: 4VPs for each shirne, 1 VP for unused favour tokens, and VPs for the position on the council. 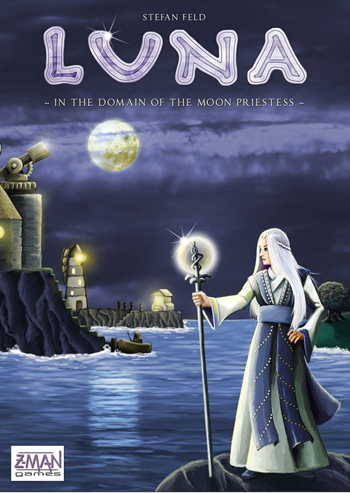 Overall, Luna is a tight Eurogame full of choices and decisions. Resources are in no way plentiful so you need to work out the best way to get the most from them every round, but also ensure they’re in good positions for the next round. There’s a lot to think about and I like how there are multiple way in which to score VPs as it mean you have real choices to make. Don’t expect to understand what the right and wrong moves are in Luna in the first turn or two. There are lots of different actions to pick from and it takes a bit of time to understand what the advantages and disadvatntages of each as well as understand where you want/need meeple to be. Placing novices into the temple is a good way to earn VPs but it comes at the cost of not having many on the islands (unless you spend actions and novices to recruit extra novices which is time consuming). This is yet another decision to be weighed up by each player. I really like the game mechanic that ends each round. On their turn, a player can spend an action to take one of the time tokens and, when there are no time tokens remaining, the round ends. I like this because there’s always the threat that a round could end very quickly (it could end in just one turn’s time). Of course, most players take various actions so you’ll usually get to take multiple actions but you do need to watch what other players are doing so you don’t try to accomplish something which you won’t have time to complete. It also this system ensures that players with no other actions left to perform (maybe through having few novices) aren’t at the complete mercy of other players with lots of active novices left. Players are encouraged to take the last time token as it scores 1 VP too. Player interaction occurs mainly on the temple tiles – not just the placement which can dislodge opponents’ novices but also a player can claim one specific type of tile and block an opponent from doing so. There’s also a bit of player interaction in moving the Apostate too. However, I really like how no player can horde favour tokens to block other players as this would be too unfair. Total VPs during the game are secret as VPs are recorded using VP chips, not a score track. We played with our VP chips on the table but stacked so their values were secret. Not knowing the exact scores was an interesting factor – I think it stopped some analysis paralysis in the final rounds – but I think it might be interesting to know the current total scores once or twice throughout the game. Rules are included for a solo player game which sound interesting. I haven’t tried them but I like how thought has been put into this when it could easily not have been added. Luna’s decisions and fine balance of resources reminds me of games like El Grande which require clever maneuvering of your meeple and a single one can make all the difference. After the initial myriad of choices, Luna turned out to be surprisingly good – you really feel hands-on in calculating your strategy. I’m not totally sold on the theme (I don’t think it will attract interest on its own merits) but it works well once you understand the rules. This entry was posted on Monday, December 13th, 2010 at 10:12 am	and is filed under Board Games, Luna. You can follow any responses to this entry through the RSS 2.0 feed. You can leave a response, or trackback from your own site.